The Easter Day in Russia is always great and festive. Nowadays, Easter is celebrated everywhere in Russia. Even in places that previously hadn’t celebrated Easter. Such as in hospitals, prisons, by soldiers, and others. At Easter, all of Russia celebrates the rise of Jesus Christ. Easter Day is believed to be the birth of a new soul. The light of Christ can warm the souls of the people, their families, friends, and the people around them. For orthodox Christians in Russia, the pre-Easter period lasts 40 days. They fasted without meat, milk, and eggs. In the holy week, they only eat vegetables and nuts. Fasting for Christians not only does not eat and drink, but also fasts from all forms of entertainment. During Holy Week people go to church every day. When Easter arrived, the church bell sounded as a sign that Jesus Christ had risen. It was accompanied by a lit candle procession. The Russians go to church on Saturday night and Easter night. They sing the hymns that the priest puts in praise. During worship, the pastor and his congregation exchanged greetings – ‘Christ has risen!’ And ‘Verily he has risen!’. The whole ritual left a deep impression, and the joyful screams of the people echoed in the night sky. After that the priest blessed the people’s food. After that the congregation went home and had a happy party. At Easter there is a custom of the Russians, is to give eggs to friends, family or close relatives. The eggs are decorated with beautiful pictures. While giving eggs, they say, “Jesus Christ has risen”. 100 years ago, a Faberge jewelry factory made beautiful Easter eggs made of gold, silver, diamonds and other precious stones. During Holy Week, the Russians bake kulich, the traditional dry and light Easter bread. The color and decorate hard boiled eggs. Some people still maintain the traditional way of replacing eggs with onion skin boiled in water. 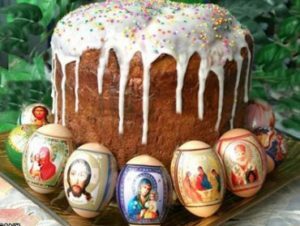 Orthodox Christians took their eggs and kulich to church for Easter blessings. The first record of the Holy Fire was discovered in the 4th century. At that time, it was called the Holy Light. It symbolizes the light emerging from the tomb of Christ after its resurrection. During the first centuries of Christian spread, there were rules of blessing and lighting up the night light before the Easter service at the Church of the Holy Sepulcher. Over time, this tradition turned into a celebration and is known as the Miracle of the Flame of Fire. In the 2000s, Holy Fire had special significance for Russian citizens. According to popular belief, this miracle generally confirms the faithfulness of Orthodox faith. Moreover, the Holy Fire is now a symbol of the Russian bond with the Holy Land. The Reduced Fire Festival was broadcast on Russian television. This is the most lively and exciting celebration you can imagine. The Church of the Holy Sepulcher is filled with pilgrims from various countries. Many congregations, coming from Middle Eastern churches, calling on Christ, sitting on each other’s shoulders with a pile of candles waiting to be lit. All the candles were put before the celebration and a miracle suddenly felt throughout the building. The light above the tomb of Christ is a sign of the descent of fire. When the patriarch and the Armenian bishop came out with the white candles that had been burning, the joy among the congregations would be even more volatile. People try to light their candles with this fire and even let fire touch their face and hands. They believed this fire is to be harmless. This procession is clearly different from the usual religious worship. Children are decorating eggs for Easter Day. Many Eastern and Southeastern European have this tradition. Traditionally, eggs are decorated in red. The red eggs had magical powers, and brought good luck and health. There is a sad side to the Easter celebration in Russia. The tradition of visiting the cemetery to commemorate the dead relatives has survived since the Soviet era. People usually make pilgrimages to the graves of deceased family members, eat Easter eggs and kulich, and drink alcohol.